Buongiorno ragazzi, ecco l'outfit indossato per la prima giornata di fashion week: gonna plissettata in finta pelle, camicia in denim, stivaletti(con un pò di tacco, giusto per non soffrire i mal di piedi), maxi shopper ed un pull che riprende il colore rosso dei collant indossati. Che ve ne pare? Hello guys, here are the outfits worn for the first day of Fashion Week: faux leather pleated skirt, denim shirt, boots (with a little heel, just not to suffer foot pain), big shopper and a pull that echoes the red color of the tights worn. What do you think? Good day and see you soon! bellissima Fabi!! eri fuori dalla sfilata di richmond qui?? Ciao Chiara! Non sono stata a quella di Richmond, le foto sono state scattate nel parco di Via Palestro. I really like this look on you! Great colour palette, this suits you very well! you look gorgeous hun!! I have a worldwide perfume giveaway planned in a weeks time..so make sure to drop by and dont miss it! Ok! I'll take a look about that! Thanks! Great Outfit Sabri...nice red pantys and so cute sweater with same colour. Great stylismus. Passero' sicuramente da te, grazie x il commento! 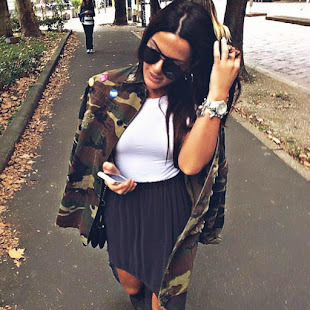 nuovo outfit post sul mio blog: ti aspetto!!! I like the way you wore a sweater over a denim shirt!!! Very very nice!!! Nice look, love all the layering a colours with black :) Looks great! I like your outfit, it's so awesome. I especially love the jumper!